blog.josephhall.com: Amano Chocolate: Finally Available! I'm pretty excited. Art Pollard dropped off a couple of bars of Amano Artisan Chocolate chocolate to me a day or two ago, in the hopes that I would post a review. In the spirit of full disclosure, I will tell you that while I'm sure he was hoping for a good review, he did not even ask for one. He also did not pay me in anything except for two free bars of chocolate. I should also tell you that while I did not meet Art until after he started building his chocolate factory, we have grown to become friends. That said, I still plan to offer an objective review of his product. I hope to offer more fact than opinion, in the hopes that the reader will be able to come to their own conclusions. I've mentioned Art's chocolate several times in the past, often bemoaning that it was not available to the general public yet. It has become available in the past month or two, from a few retailers (mostly in Utah, though I understand there are a couple in Seattle), as well as online from http://www.amanochocolate.com/. 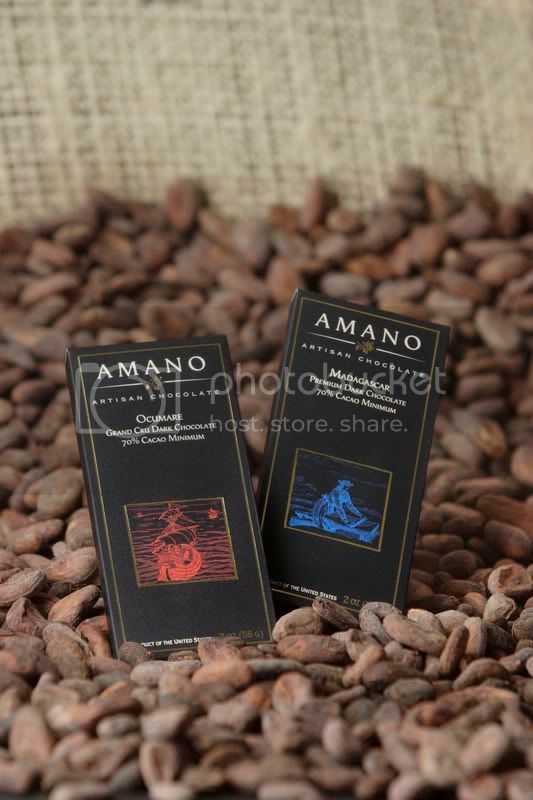 Amano seemes to be big on individual variatals and single-bean origin chocolate, and they have begun by offering Ocumare Grand Cru Dark Chocolate and Madagascare Premium Dark Chocolate. I will refer to these from here on out as Ocumare and Madagascar, respectively. Both chocolates are labelled as having a "70% Cacao Minimum", which I have found to be much too dark in some brands, and just about right in others. I would venture to say it's just about perfect for Amano, but I will get to that in a moment. 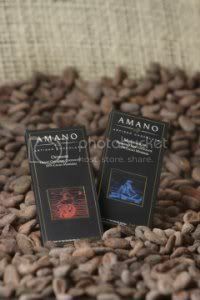 Amano Artisan Chocolate does not necessarily seek to provide one consistent flavor across each bar. As their name implies, they offer a more artistic approach. Their goal is to process each batch to the perfect level for that specific bunch of beans, to draw out the best possible flavor. Neither of the bars they offer are milk chocolate, though they both include Tahitian vanilla pods, to accent the chocolate's flavor. I should also note that many high-end chocolates don't really taste anything like your standard Heryshey's bar. In fact, it tastes so different that I am hesitant to apply the same category to both of them. I decided to go with several separate tastings of the chocolate, rather than gobbling it down all at once. In my first tasting, I started with the Madagascar. It was intensely fruity, which makes sense, because cacao really is a fruit, strange though that may seem. In fact, I would even go so far as to say it has a lot of citrus notes. It melts well on the tongue, and is obviously meant to be savored slowly, not quickly devored. Biting is not recommended. Allowing the chocolate to slowly melt in the mouth is the only way to go. Fortunately, Amano has used a mold with small squares, to help break it into more manageable pieces to stretch it out, or to share with friends. My first taste of the Ocumare was very disappointing. Something about the flavor seemed... dulled. In fact, it largely paled in comparison to the Madagascar which I had just tasted. I suspected that having eaten them so close together might have marred my tasting experience, so I decided to go with a new tasting some time later, when I no longer had the taste of chocolate in my mouth and the smoothness of the cocoa butter coating my tongue. This proved to be wise, and suddenly the flavor of the Ocumare opened up with a somewhat less intense fruitiness, accented by floral notes which were just strong enough to make themselves be known, but not so much as to be obtrusive. The citrus was less pronounced, but still evident. This chocolate ended up having a much rounder flavor, and is likely a better introductory chocolate for the novice. I might note that I went back to the Madagascar immediately after the Ocumare, and found that its intense fruitiness was tempered by the Ocumare that still lingered on my tongue. It was much less powerful than it had been, and as much as I had liked it before, I think it was a lot easier to handle. If you are planning a chocolate tasting which includes Amano chocolate (and why would't you, at this point? ), I would recommend tasting the Ocumare first, and then the Madagascar. Of course, your mileage may vary. I'm very impressed with Amano's initial offerings, and I look forward to seeing more varieties in the future. Art has really managed to pull off an excellent chocolate. While this chocolate is perfect for eating out of hand, I think that it might pair well with other ingredients for some truly excellent dishes. A good chocolate is like a good wine, cheese, coffee or tea. When the chocolate maker plays his or her cards right, the complexities and subtleties will be worth discussing at length. Amano is off to a good start, and I think their product has the chance to truly change the way some people look at chocolate. I had this stuff over a month ago - you can buy it at Caputo's market in downtown. I liked what I had (ocumare) and although there are better (Michel Cluizel, Domori, Amedi) this was better, to me, than much of what Valrhona produces. All in all I think this is a good initial effort by an American chocolate company that actually starts at the bean; we don't have too many around that can begin to compete with the world's best.